You forgot to download Money Manager EX	. Click the link below to download it. 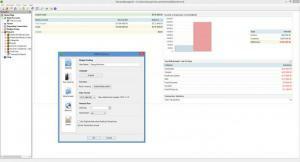 Money Manager Ex nicely blends together ease of use with useful finance management functionality. From its intuitive and very easy to use interface you can access lots of features that will help you efficiently manage your finances. Thanks to this free and cross-platform personal finance software tool, anyone can conveniently keep track of their finances. As mentioned above, Money Manager Ex is a cross-platform tool. This means that it is available for multiple platforms: Windows (32- and 64-bit; installer and portable), Mac OS X, Linux, and Android. The setup wizard that helps you install Money Manager Ex on your Windows PC asks you to choose between a Full, Minimal, and Custom Installation. The Full Installation features the following components: core files, help files, lots of languages. Speaking about wizards, one will help you create a new database and another will help you add an account. The database wizard allows you to pick a currency and choose a user name (please note that the database you create will store important financial information; for that reason, there’s an option to encrypt the database). The account wizard allows you to enter an account name, pick an account type (checking, term, investment), and enter an initial balance. Money Manager Ex has a user friendly, intuitive, easy to navigate interface, and good looking interface. I have nothing but words of praise for the interface. From the application’s interface, you can easily access lots of features that will help you manage your finances: manage one or multiple accounts; add transactions, manage transactions, enter lots of details when adding a transaction; manage assets; manage repeating transactions; create a new budget; access reports that tell you where the money goes, where the money comes, and other reports; set up reminders for recurring bills and deposits; import, export data; and more. Released under a GNU General Public License (GPL), Money Manager Ex is free and open-source software. There’s much to like about Money Manager Ex: it's available for multiple platforms, it has a user friendly interface, it helps you manage your finances, it is free and open-source. Money Manager Ex is available for multiple platforms: Windows, Mac OS X, Linux, Android. Choose between a Full, Minimal, and Custom Installation. A wizard will help you install Money Manager Ex on your PC, a wizard will help you create a database, a wizard will help you add an account. Money Manager Ex has a user friendly, intuitive, easy to navigate interface, and good looking interface. Lots of features that help you manage your finances are offered for the great price of free. You can download Money Manager EX free here.